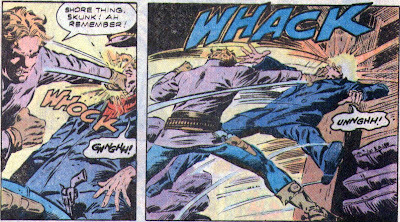 Matching Dragoons: Jonah Hex #63 "Ship of Doom!" Jonah Hex #63 "Ship of Doom!" 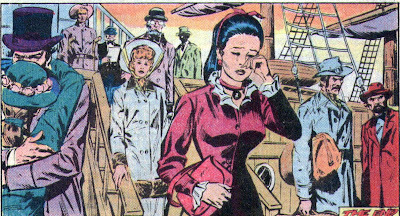 Jonah Hex & Mei Ling, in the hold of the ship Malay Tiger, have discovered that the ship is smuggling opium. Capt. Quirt, Barnaby Sledge and several crewmen descend into the hold with Sledge explaining why Jonah & Mei Ling were really brought aboard the ship. Seems like the Capt had killed a crewman via keelhauling and they need Jonah to replace him. As for Mei Ling....heh heh heh, if'n ya know what I mean. 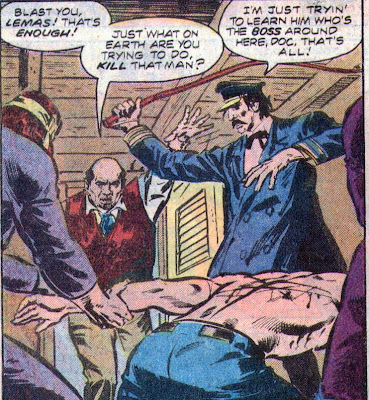 Well, Jonah responds to that by slamming Sledge's head into a huge timber, splitting his skull and killing him. The rest of the crew rushes Hex and they finally take him by slamming a crate over his head. Quint orders that Jonah be stripped and held down and Quint commences whipping Jonah across the back. Of course, one of the crew decides to protect Mei Ling from the horrible sight by holding her head against his chest. Once Jonah recovers, he is put to hard work and then after an undisclosed amount of time one of the crew starts complaining about cramps. He breaks out in a terrible sweat and three other crewmen realize that he has cholera. They grab him and toss him overboard in order to save themselves. The ship's doctor comes running and explains that cholera is passed through food and water, throwing the man to his death did nothing to save the others, in fact he can spot it in several of the other crew, including Jonah. The Doc orders all of the infected men to bedrest, thinking to himself that at the best, in two weeks maybe 15% percent will survive. Woodson then grabs the broken bottle and starts chasing Ginny around the house. Ginny is screaming at the top of her lungs and Jonah suddenly snaps out of his fever dream to find himself in the bunk in the ship but the screams continue. Once Jonah makes his way through the ship, he discovers that Mei Ling has been trying to take care of the sick crew on the deck but Capt. Quint is trying to force himself upon her. Jonah stumbles up the stairs, but he is still sick and Quint starts pummeling him. Quint pulls out his whip once again and Jonah grabs a crate hook. 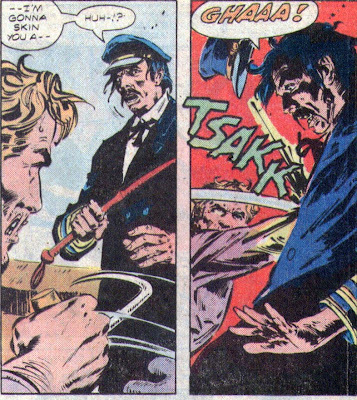 Of course, Jonah grabs Quint's dying body and heaves it overboard. Mei Ling shouts for him to stop, but it too late. Jonah has just thrown overboard the only man well enough to navigate the ship. 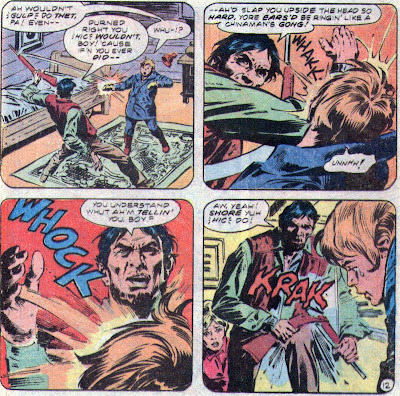 The entire crew is either dead or dying except for the doctor, Mei Ling, and a very sick Jonah Hex. Jonah and the doc heave the corpses overboard and for the next 22 days they survive on fish they catch as the men continue to die. Then late one night a huge storm hits the ship. Jonah is doing the best he can to hold the ship together. Jonah shouts for help from the doc who is below deck, trying to lash the water casks doen so they don't break but it is too late, the ship slams into some rocks and the entire ship breaks apart. 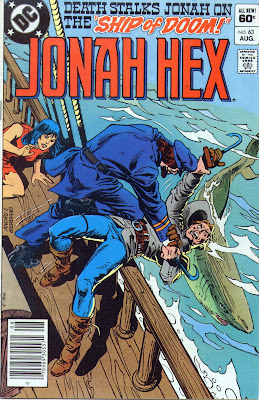 Jonah Hex, Mei Ling and the doctor are thrown into the water and the sharks start swarming. In two creepy panels, the Doc goes down. Mei Ling makes it to a life boat but Jonah is too far away and realizes that he has to fight the shark. You read it right. 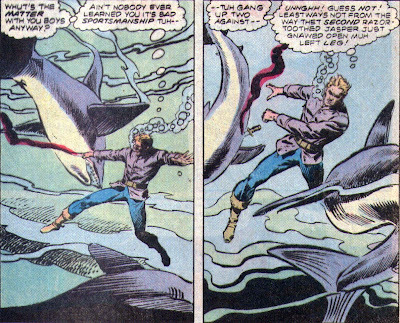 Jonah Freaking Hex vs. a Freaking Shark!!!!! and when this man who is badass incarnate dives below the waves to encounter the shark on its own terms he learns... he will be fighting TWO FREAKING SHARKS! Mei Ling, Mistress of the Obvious! But on the plus side, them there shark be-yotches are bleeding a whole lot more than my man. Mei Ling bandages Jonah bitten leg and they lay in the lifeboat, embracing each other. Seven long days later they are picked up by another ship bound for San Francisco. The ship's surgeon is able to treat Jonah for the bite and he says that Jonah will be on crutches for a few weeks. Once the doc leaves, Jonah apologizes for how he has messed up their lives and he wants to start over. Mei Ling replies that sometimes people love one another but there is no way that they can be happy together. They tried hard to be married, but they only made each other miserable and Mei Ling tells Jonah goodbye. 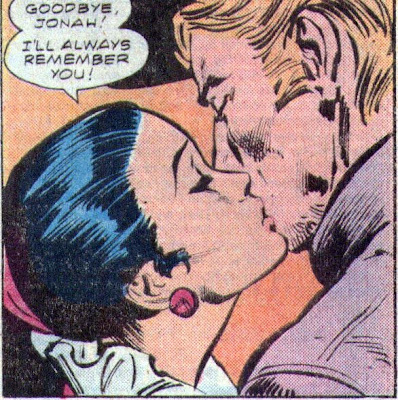 Three weeks later in San Francisco Mei Ling is leaving the ship and Jonah presses her once more. Mei Ling says that she will not change her mind and that she is going back to her brother's house to take care of their son, Jason. Men Killed by Jonah - 2 and two sharks! Running Total - 362, a snow leopard, and TWO SHARKS! Jonah's Injuries - Whipped, knocked out, contracted cholera, shark bite on left leg. Let's take a look at the flashback to 1848. Ginny left Woodson in June of '48, so this had to take place between Jan and, oh, let's say, end of March (depending on where the Hex family called home), so that places Jonah's birthday in that timeframe rather than in November. As a storyline, this has been one of my favorites with Jonah being a fish outta water (hee hee, I made a funny, see? Jonah was fighting sharks and I made a reference to fish? Ahhh, never mind), Mei Ling endangered, and foreign intrigue. A+ all around on this storyline. Did I mention the SHARKS?!?!?! Take THAT Devil Dinosaur! Gosh, that was exciting! It is however, one of the reasons why I simply can't STAND Mei Ling. The sharks however, were fabulous. I re-read this one last night and was was appalled all over again as I was in 1982 when they threw the first man with cholera overboard. 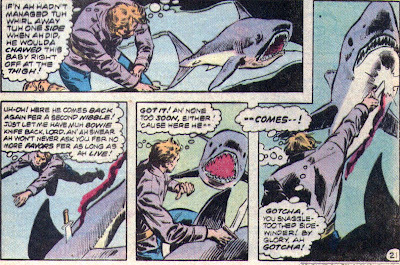 The panel showing the poor guy nearly submerged had me gasping in an EC Comics-like "Good Lord (Choke)!" kind of way. Other than that, this was a slam-bang, action-packed epic!